This past week I have been struggling with writing my blog. I have had an intense week of pain shadowed by the inability to write a quick (but fabulous) post. The combination of the two became overwhelming frustrating as I racked my tired and overstimulated brain for an article that would rock the world. Needless to say the expectation I put on myself was unrealistic. I was trying to write perfection for the wrong reasons. I was looking for validation. Validation that my writing was important. Validation that I was doing something positive out of a devastating chronic disease. I wanted to be recognized, published. I wanted someone to hear my voice. And then I realized. That is not the purpose of MY writing. I have been journaling and writing since I was old enough to form sentences. From an early age, writing was an escape for me, a place that I was able to calm my scattered ADHD brain and process the world around me. As I grew older it became my best friend. I wrote of heartaches, difficult emotions, fears and my dreams. It was the place where I could be honest without judgment, without punishment, without fear. I wrote every single day and sometimes all day. Writing helped me find and define myself. Through my words I was able to declare my sense of individuality and work through issues that I wouldn’t allow anyone else near. I was always grateful to have my words. My journals. My stories. My songs. When life was difficult my writing became my solitude. My safe place. As my life played forward I pushed my writing to the side but always came back to it when I needed answers as I felt it was a gateway into my soul. The last time I was immersed in my writing was after a break up that rocked my world in my mid twenties. The writing led me out of that dark place and into a new life of adventure in the Caribbean. My writing then morphed into story-telling of my adventures and hopes that I would write a humorous book of boating mishaps, jungle living and meeting the most interesting people from around the world. These stories have not been written but I am hopeful that when I am ready, I will be able to share them with the world through a book (hopefully a best seller!) that will make you laugh! But until that happens, this is where my words are needed. Right here in the blog. My words are needed to help me share my most challenging story with you. They are needed to express raw emotion of fear, sadness and triumph as I battle what is known in the medical community as the “world’s most painful disease”. As always, my writing is a honest, soul wrenching, tear stained view into my life, my experiences and my heart. Often times I type faster than my thoughts are recognized and only later can I read through what has poured through my soul. On those days I don’t edit. I don’t sugar coat, I don’t embellish, I don’t hide behind a curtain. My writing is unfiltered. After my last post of “When Warriors Cry” I realized that I might have scared some people. My writing may have been too honest for an easy read. Nor did it offer humor, a side of myself that people love and the only side that some people want to see. It was raw. It was filled with fear. It was my pain translated into words. A dear friend who has shown me so much love and support confessed to me last week that she had not read my blog because it was sad. She shared that she was also dealing with stuff that was overwhelming emotionally and that to read my blog would be too much. I understood. Her confession has stayed with me this week and has triggered many reactions. First and foremost, this is her honesty and I respect that with every fiber of my being. Secondly, I empathize with her because I know the delicate balance that we must have when handling difficult emotions. I also know the heart of this person is so pure. She lives her life showing love and kindness and becomes saddened when the world demonstrates hatred, violence and injustice. Lastly, I was angry. Not because she did not read but because this is my story right now. I was angry at the universe. I was angry that I am sick. I was angry that right now my story is so damn sad that sometimes people can’t handle the fragile nature of it. Sometimes I cannot handle the fragile nature of it. This last reaction has been heavy on my heart. I compulsively thought of new topics to write about, new perspectives to share, funny witty articles that would make people feel good, that would make people smile. This is what I wanted to write damnit! Not about the damn disease. And then it happened. I sat in front of my laptop. Blank paper. Blinking curser. Nothing. No words. No laughter. No wit. No adventures. The anger turned into sadness and the sadness turned into a gratifying presence. I allowed myself to be sad. after all, it’s okay to be sad. I knew I was mourning the person that I have lost through the illness. I was mourning Me. Through meditation, helpful conversations with a good friend, reading a post on gratitude and a much needed therapy session, I am gaining acceptance of my story. My sad story. I’ve realized that some stories aren’t suppose to make you feel good, some stories are suppose to be sad, rouse anger and stay with you through the day. It is these stories that facilitate change. These stories create noise in order for people to care, research to be done and cures to be found. I know that my story alone is not the be all, end all but it is a piece of the puzzle that helps raise awareness. 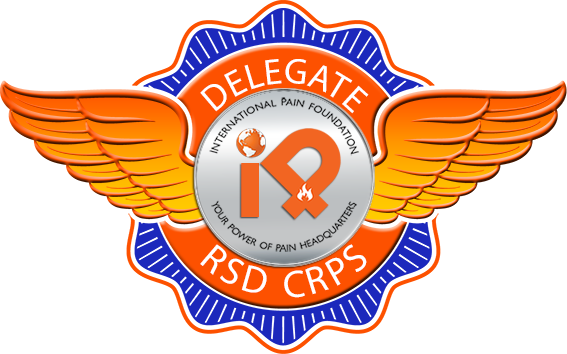 Now you, yes you, know about CRPS and its devastation. Now you know if any injury isn’t getting better to ask about CRPS and it can be treated with higher chance of remission. This knowledge helps all of us. So yes my story is sad and I admit, scary because it can happen to anyone. I appreciate your support in reading my words but there is no obligation. I vow to write about love, adventure and happiness along the way but you won’t always see the side of Kelly that you love because life isn’t perfect. Today, my writing continues to be a place where I can heal and now try to help others. My writing is therapeutic for me, helps me process, come to terms with this life and to build strength to fight the most difficult battle I have ever faced. It is my hope that the writing reaches one person, just one person and helps them continue to have hope that there are better days ahead. That it shatters their loneliness and makes them feel as though someone understands what it is like to walk in their shoes. I believe that the words that fill this blog will find the person they are meant for. That the blog will be read by whoever may need it in that moment. And even unread, these words are healing my soul and they are redefining my identity just as they had when I was 13. *this post is dedicated to a friend I have never met. A friend who is always one message away and always able to shine a light on the truth even on the darkest of days. Thank you for your friendship, your support & for allowing me to feel that I am not in this battle alone.